Community colleges play an important role in providing first and second generation immigrants access to higher education and the opportunity to earn a postsecondary credential. However, immigrant students may face obstacles in pursuit of a postsecondary degree, particularly second language challenges that can inhibit their success in college-level coursework. 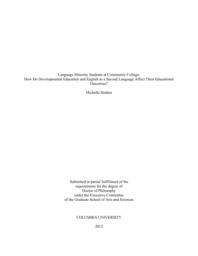 This dissertation seeks to provide some of the first evidence on the impact of developmental English and English as a Second Language (ESL) courses on the educational outcomes of language minority students at community college. Using a large, administrative dataset from the City University of New York (CUNY) on applicants and enrollees in the fall 2001 to fall 2007 cohorts, tracked for at least three years to summer 2010, I highlight the diverse demographic and academic outcomes of language minority students at the community colleges, and then conduct two quasi-experimental studies that use a regression discontinuity design and a difference-in-differences approach to identify the effects of developmental education and ESL coursework on this student population. These studies provide evidence that certain features of pre-college English coursework can have potentially positive or negative effects on specific outcomes. In particular, assignment to and enrollment in pre-college reading and writing coursework compared to just writing coursework is tied to positive effects on persistence and perhaps learning, while the longer sequence length in ESL compared to developmental English decelerates language minority students' progression through college and degree attainment.